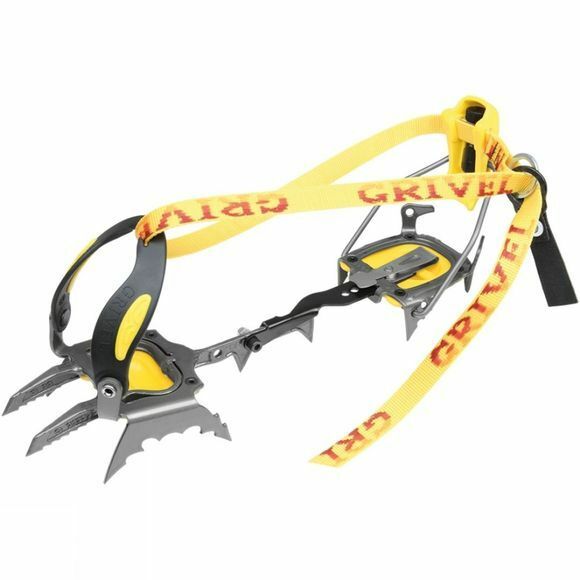 The Grivel G22 Crampon is the twin-front-pointed evolution of the revolutionary G20 monopoint model. Patented Mono-Rail technology distributes the points in an intelligent and original way and, as there's only one bar running up the middle of the crampon, weight is saved and penetrating power is increased too: a single straight bar directs force into the hot-forged front points. An evolution of the Cramp-O-Matic step-in binding system, the New-Matic binding utilises the C-O-M rear bale and lever, teaming them with a plastic harness system, hinged from two front posts, which retain the boot securely even if it has a shallow, worn front welt or if overboots are being used.